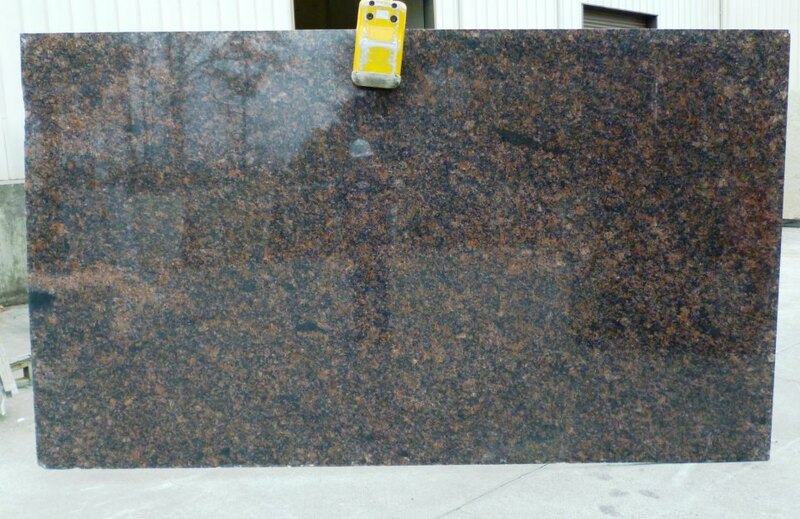 Tan Brown Granite is quarried in southern India. It is a two tone stone with black and brown minerals that are clearly visible from a distance. Upon closer inspection the intense deep black colors remain and you can see the lighter grey tones which help lighten the stones appearance. The brown minerals are much more varied in color when viewed at a closer level.You will also notice tiny little quartz crystals embedded in sections which sparkle when rays of light touch the surface. The brown spots can range from a metallic copper brown to dark chocolate brown. The darker browns are usually less common, and the overall appearance will generally be a light copper brown. The darker browns accentuate the already stunning color combination of the light brown and blacks in the granite.There is really not a lot of variation in the mineral content of this stone. When combined with white cabinets and lightly colored walls – Tan Brown granite countertops dominate the room. The dark black and brown colors are a perfect contrast to the light cabinets. When combined with maple, cherry or lightly stained cabinets,the color range of the light and dark brown granite blend into the room.If you have dark stained cabinets, your countertops will be understated. The black of the stone blends in with the darker cabinets.